I recently had a studio challenge…things have gotten so out of control (ie messy) that I couldn’t find my 2nd case of colored pencils – all the browns and greys. Instead, I decided to try my Albrecht Durer watercolor pencils, which were NOT hiding from me. And guess what? They work fabulously even without water! Watch the video below or click Check out more on Machu Picchu to see it in HD on YouTube. Check out more on Machu Picchu. It’s one place I’d like to visit someday! Sandy you are such an inspiration, this is A-mazing! Awesome coloring and video, thanks for sharing! This is really beautiful, Sandy. What color of Lawn Fawn ink did you use to stamp the image? This Llama scene causes me to take a deep breath and smile. Very pretty card. Also I wonder if other water color pencil brands would work as well, I’m going to find out! Thanks for the card, the deep breath and smile you put on my face today. 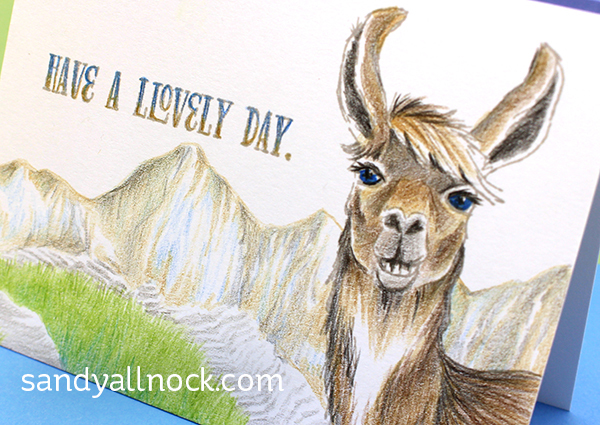 Llove your llama and your card. I always admire your artistic backgrounds so much. I do think a sprig of green grass sticking from his/her mouth would look llovely, too. Thanks so much, Sandy for your videos!!!! Once again, you’ve worked your magic! 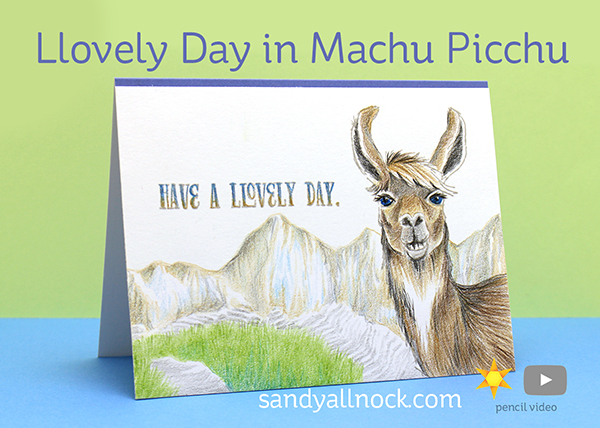 What a beautiful llama, and you sketched a perfect Machu Picchu background. Thanks for the video. Sandy, you’ve got this down pat! How gorgeous.